PUNTA GORDA/ENGLEWOOD BEACH, Fla. (March 28, 2017) – The Charlotte County Tourist Development Council (TDC) is pleased to announce the Charlotte County Event Develop Program (EDP) is now accepting applications for new events taking place in the summer of 2017 and Fiscal Year 2018. The EDP provides funding to assist in the development of new events occurring between May 1 through Sept. 30, 2017 (Summer 2017), and Oct. 1, 2017 through Sept. 30, 2018 (Fiscal Year 2018). The primary objectives of EDP are to attract overnight visitors to Charlotte County and promote Charlotte County as a tourism destination. 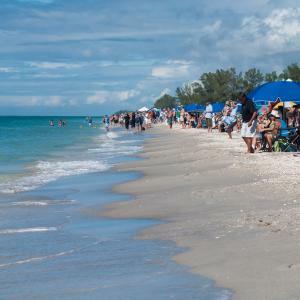 This program is administered through the Punta Gorda/Englewood Beach Visitor and Convention Bureau and is funded through Charlotte County’s Tourist Development Tax. In order to be considered for funding, the event must be new in Charlotte County. Events previously funded by the EDP may apply for second year funding. Funds received pursuant to the Event Development Program may only be used for the purposes authorized in Section 125.0104(5) of the Florida Statutes and specified in the program guidelines. Applications for Charlotte County Event Development Program funding and complete guidelines can be found at www.pureflorida.com/tdc/edp. All EDP applications for new events happening in the summer of 2017 (occurring May 1 – Sept. 30, 2017), will be reviewed and voted on by the Charlotte County TDC as they are received. Events occurring in Fiscal Year 2018 (Oct. 1, 2017 – Sept. 30, 2018) will be reviewed and voted on by the Charlotte County TDC during the May 5 meeting. The number of awards and the amount of each will be dependent upon the availability of designated funds and specific allocations. The maximum single event allocation is $10,000. The total amount available for summer 2017 events is $20,000. The total amount available for events occurring between October 1, 2017 and September 30, 2018 is $40,000. Questions regarding the program can be directed to Lorah Steiner, Director of Tourism for Charlotte County at (941) 743-1900 or Lorah.Steiner@charlottecountyfl.gov.